↑ Sir Michael Somare (2004-12-06). "Stable Government, Investment Initiatives, and Economic Growth". Keynote address to the 8th Papua New Guinea Mining and Petroleum Conference (Google cache). Retrieved 2007-08-09. ↑ "Never more to rise". The National (February 6, 2006). Retrieved 2005-01-19. ↑ United Nations, Department of Economic and Social Affairs Population Division (2009). World Population Prospects, Table A.1. 2008 revision. Retrieved 2009-08-28. 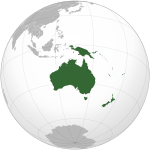 ↑ 5.0 5.1 5.2 5.3 "Papua New Guinea". International Monetary Fund. Retrieved 2009-10-01. Àtunṣe ojúewé yi gbẹ̀yìn wáyé ni ọjọ́ 16 Oṣù Keje 2017, ni ago 08:22.